UT System Board of Regents Chairman Paul Foster speakes to press at Thursday's Board of Regents meeting. In the first UT System Board of Regents meeting since Chancellor Francisco Cigarroa asked President William Powers Jr. to resign, Chairman Paul Foster expressed disappointment with “insulting and disparaging comments” sent to Cigarroa over the past week and called on the board, System and University to move forward. Foster, who said he was pleased Cigarroa and Powers agreed on Wednesday to set Powers’ resignation for June 2015, also asked the Texas Legislature not to try influencing board decisions. While the House Select Committee on Transparency in State Agency Operations co-chairs sent Foster a letter on Monday requesting that Powers not be removed, Foster clarified he was not criticizing the committee’s investigation into Regent Wallace Hall or its right to do so. During the meeting, Regent Alex Cranberg said he agreed with Foster’s comments and mentioned Hall had also received negative backlash since news broke of Cigarroa’s request on July 4. “I think it’s time for people to put their swords down and start trying to look to the future,” Cranberg said. Among Cigarroa’s recommendations were increased transparency in admission processes and ending the practice of allowing letters of recommendation sent by influential individuals directly to a president or dean’s office instead of through the prescribed process to be considered in admissions decisions. In May, a limited System inquiry into the University’s admissions determined there was no structured system of wrongdoing but found instances in which letters of recommendation sent directly to Powers or a dean likely influenced admissions decisions. Foster said he will form a search committee for Powers’ replacement in August. Cigarroa announced his own resignation in February to return to practicing medicine at UT Health Science Center at San Antonio but will remain in his position until his replacement is selected. After the meeting, Foster said the board and System have interviewed multiple candidates. In a major step away from the private, behind-the-scenes disagreements among the members of the UT System Board of Regents, board Chairman Paul Foster publicly asked Regent Wallace Hall to resign at the board's meeting Thursday. Foster addressed Hall directly at the board meeting and said, even though Hall has not violated any board rules or policies, his resignation would be the best thing for the System. The statement comes three days after the House Select Committee on Transparency in State Agency Operations determined there are grounds for Hall’s impeachment. The committee had been investigating Hall since June 2013 for potentially overstepping his bounds as a regent. The committee is scheduled to meet on May 21 and 22 to determine the nature of specific articles of impeachment. If the committee votes on specific articles, Hall’s case will go to the full Texas House of Representatives. If a majority of the members of the House approve of the case’s merits, it will go to the Texas Senate, where members will convene as a court to make a final decision. If the Senate concurs with the committee’s recommendation, Hall will be the first non-elected official to be impeached in Texas history. At the transparency committee meeting on Monday, state Rep. Lyle Larson, R-San Antonio, called on the regents to issue a vote of no confidence in Hall. Despite several regents offering statements on Hall, Foster opted not to take a vote of no confidence Thursday. Hall left the meeting without making any statements. Regent Jeffrey Hildebrand, who was appointed to the board in February 2013, also called for Hall’s resignation at Thursday’s meeting and said it was time for the board to focus on other matters. “I think the time has come to move beyond the controversy,” Hildebrand said. “It’s been a controversy that, for far too long, has consumed too much of the board’s resources. … We must move past this controversy and get to the business at hand of moving this System forward that is so vital to the state of Texas." Foster also addressed the various leaks of communications from executive session meetings that have occurred this past year. In August 2013, Regent Alex Cranberg recorded an executive session meeting and took detailed notes, which were released to the press. Notes that Hall took during an executive session meeting were also released. “Trust is something that is earned and once violated is very difficult for it to be regained,” Foster said. Cranberg — along with Gene Powell, regent and vice chairman of the board — defended Hall at Thursday's meeting and said Hall only pursued matters of extreme importance to the System and its institutions. Foster said he has a set of recommendations he wants to implement on the board in order to combat some of the problems the board has encountered this year, including the appropriate role of a regent and procedures for maintaining the confidentiality of private board discussions. Foster said he will send his recommendations to the regents within the next few weeks so they will have time to review them before taking a vote. The discussion came after Hall asked the regents to reopen its investigation into the nonprofit UT Law School Foundation, and its connection to UT President William Powers Jr. Hall’s request was voted down 5-3. The UT System conducted a review of the foundation in November 2012, which some regents — including Hall — were not satisfied with because they felt it was not critical enough. The regents then gave the case to the Texas Attorney General’s office to conduct another review. At Thursday’s meeting, Hall said the attorney general’s office had yet to open its investigation. Foster said the attorney general’s office was waiting on a letter from Hall, but Hall claimed he had given the office all the information he had. Powers, who was at the meeting, said UT and the System should be looking forward. State Rep. Trey Martinez Fischer, D-San Antonio and member of the committee investigating Hall, praised Foster for requesting Hall’s resignation in a statement released after the board meeting. This article has been updated since its original publication. The full name of the committee investigating Hall is the House Select Committee on Transparency in State Agency Operations. UT System Regent Alex Cranberg says he recorded System Chancellor Francisco Cigarroa’s remarks during a closed session meeting of the Board of Regents in order in order to correct the notes he took during the meeting. UT System Regent Alex Cranberg recorded a closed session meeting of the Board of Regents in August, without the knowledge of System Chancellor Francisco Cigarroa, who was present for the meeting. System spokeswoman Jenny LaCoste-Caputo said all members of the board have been asked not to record meetings held in executive session, which are closed to the public. “There is no specific rule saying that you couldn’t record an executive session, although the board attorney would have never thought someone would record it,” LaCoste-Caputo said. In a statement, Cranberg said he recorded the meeting in order to preserve Cigarroa’s remarks for future discussions with members of the board. “I believed that it was very important that I understand exactly what the chancellor said and how he said it, both for my own guidance and to be better able to discuss these remarks later with my fellow regents,” Cranberg said. Cranberg said he used the recording to correct written notes he took of the meeting, cataloging Cigarroa’s performance assessment of President William Powers Jr. and the regents’ discussion on Powers’ future as president. Tensions between Powers and members of the board have been ongoing since 2011. Cranberg’s notes mention Cigarroa’s request for Powers to resign, which Powers refused. At a December board meeting, which some speculated would end in Powers’ termination, Cigarroa recommended Powers remain president of UT, although he issued a warning to Powers, urging him to improve his relationship with the System and the board. Cigarroa announced his resignation as chancellor in February and said it was unrelated to the existing tension within the board. Cranberg’s notes on Cigarroa’s performance assessment of Powers include a discussion of Cigarroa’s resignation. The notes also indicate Powers wanted to remain president until his son, a junior at the University, graduated. UT spokesman Gary Susswein said this claim is not accurate. “The chancellor expressed his support for the President in December, and President Powers has been very focused since then on working with the chancellor and the chairman and the other regents to move past this,” Susswein said. UT President William Powers Jr. sits with Sarah and Ernest Butler in a 2008 photo after the couple's bequest of $55 million — the largest contribution to a public university's music school. The College of Fine Arts' School of Music was named in their honor (Photo courtesy of Christina Murrey). Read the University External Foundations Profiles to learn more about the history and financial figures of each foundation. Recent public battles over lack of oversight in the University of Texas Law Foundation threaten to bring substantial changes to a complex mechanism of private fundraising developed over several decades that has successfully raised billions of dollars alongside internal fundraising efforts. As early as next month, an advisory task force led by UT System Regents will present guidelines for a uniform structure and record-keeping procedures for all external foundations to avoid situations where UT employees receive direct benefits from external sources without administrative oversight. University fundraising is divided among internal development operations and a handful of external foundations set up as non-profits with independent governing boards. External foundations raise their own funds and contribute to the University but have limited involvement or oversight by UT administrators. College, school and unit specific endowments total $3.1 billion, according to development office numbers. The total net assets of the actively fund raising external foundations total $341.9 million, according to IRS documents. In an email to The Daily Texan, Regent Alex Cranberg said the task force’s review and report will help prevent oversight problems similar to those encountered with the School of Law Foundation. The regents commissioned the task force following a report by Barry Burgdorf, System vice chancellor and general counsel, on the relationship between the School of Law and the School of Law Foundation — one of the external foundations affiliated with the University. In 2011, Lawrence Sager, then dean of the University of Texas Law school, was asked to resign by President William Powers Jr. after receiving a forgivable $500,000 loan from the UT Law Foundation without administrative oversight. Fallout from the foundation’s loan program resulted in Burgdorf’s report, but in a contentious vote that drew criticism from state lawmakers, the regents decided to pay for another external investigation specific to the Law School Foundation. Burgdorf resigned amid the contentions, and declined requests for comment. The regents agreed to let the Texas attorney general’s office handle the investigation after pressure from lawmakers, and Cranberg said that scrutiny is distracting from the purpose of the committee’s review. Cranberg said the lack of clarity on the relationship between external foundations and the University can leave donors misinformed. Cranberg has a history of identifying flaws between foundations and the institutions they serve. He was involved in identifying “abusive practices” within an external foundation that serves three institutions during his time on the board of Metro State College in Denver regarding the sale of two building below market value. Shannon Ratliff, former law foundation trustee and former UT System regent, said he hopes the law foundation will maintain its independence from the University. The task force is also expected to recommend guidelines for the locations of external foundation offices and foundation employees. UT administrators serve as directors or serve on the board of some external foundations and some foundations also share employees with the University, including professors and administrative support. In the event of a court case, some foundations, although they are separate nonprofits, can be deemed branches of a university if they share office space, employees, public funds or state legal services, Washington attorney Thomas Arden Roha said. The laws that govern foundations vary from state to state, Roha said. He said arguments over the independence and possible mishandling of foundations tied to state universities are not common, but are not unheard of. Roha wrote a paper in 2000 at the request of the Governing Boards of Universities and Colleges that listed general guidelines for foundations. Burgdorf’s report, which was set aside by the Board of Regents, recommended the UT Law Foundation separate itself from the University by moving to its own location and not sharing staff. But taking those steps wouldn’t necessarily mean the UT Law Foundation is safe from legal repercussions. “As a general rule, I would say the law is not clear cut. You have to examine each relationship between the state, University and its foundation independently,” Roha said. The formation of foundations at UT grew from a need to supplement declining state support. State funding currently makes up 13 percent of the University’s operating budget compared to 47 percent of the budget in 1983. “We used to say that philanthropy was the icing on the cake, but I think now that it’s really more of the gas that drives the engine at a world class institution,” said Julie Hooper, associate vice president for development — the University’s internal fundraising unit. Each year the University’s colleges and departments receive $343 million in payouts from more than $3.1 billion that has been endowed to the University, Hooper said. She said these endowments help fund scholarships and academic chairs that increase the University’s ability to recruit top faculty and students. Within the Office of Development a team is assigned to monitoring endowment creation, administration and compliance of both internal and external endowments. Martha King, executive director of development, said her office oversees 5,237 endowments, including approximately 250 held by the Law Foundation. The McCombs School of Business Foundation and Lyndon Baines Johnson Foundation also have endowments that are monitored by the office, King said. She said external foundations write their own agreements with donors. The endowments also allow UT to develop academic programs that rank among the best in the nation, Hooper said. The Jackson School of Geosciences has the largest endowment of any school at UT, with $432 million and ranked ninth among other earth science schools in the 2010 U.S. News and World Report Rankings. Some schools at UT are ranked highly despite their smaller endowments. The School of Social Work is ranked seventh nationally, although its $13 million endowment is the third smallest at UT. The process of networking with the University’s 460,000 living alumni and other potential non-alumni donors requires an army of volunteers in addition to development staff, Hooper said. Each college has its own team of volunteers, most taking the form of advisory councils. These councils, which vary in size from a couple of dozen board members to more than 100, have different roles in the development of UT. At the Cockrell School of Engineering, the Engineering Foundation Advisory Board consists of volunteer members responsible for securing most of the school’s endowment and for plans to build a new school, according to assistant dean Jeff Halton. “It’s an interesting process where you are able to have people say you need the building, help design the building for the purposes which they want it designed and then give money to make it happen or ask other people for money to make it happen,” Halton said. With this 60 year old fundraising model, Halton estimates the Engineering Foundation Advisory Board has raised 75 percent of the engineering school’s total endowment. The Cockrell School of Engineering decided earlier in March to discontinue the name “Engineering Foundation Advisory Board” in its near future to avoid confusion, Halton said. The Cockrell School of Engineering is one of the few schools that still has the term “foundation” in the name of its advisory board. There has been a shift in advisory boards formerly known as foundations to disassociate themselves with that moniker. Halton said the need to distinguish the internal fundraising units from external foundations caused the change. The college is late to dropping the “foundation” name according to Kathleen Aaronson, development director for the College of Liberal Arts. The internal fundraising unit for the Jackson School of Geosciences has kept the name The Geology Foundation. The foundation precedes the Jackson School of Geosciences. The internal foundation, made up by administrators, alumni and geology experts, was created in 1953 to support the former Department of Geology founded in 1888. The volunteer councils meet biannually, but work with development throughout the year, in most cases to help raise funds, said Michael Oldham, chairman of the School of Nursing Advisory Board. Although the most generous contributors often receive recognition in the naming of campus facilities, small donations make up the bulk of giving, Hooper said. Sequestration, the buzzword for the automatic federal budget cuts triggered by Congress’s failure to pass a deficit reduction deal, was signed into law March 1. The cuts will come into full effect in April. President Obama and congressional Democrats are trying to put pressure on their Republican opponents by tying reductions in unemployment payments to sharp, across-the-board defense cuts, both of which are blind to the efficiency or inefficiency of the programs in question. Republicans have considered it to be a necessary evil, accepting steep defense cuts to prevent an Obama “victory” akin to that of the tax compromise. According to The New York Times, furloughs will be given to defense employees by April 6th. As is always the case, large cuts affect us all. According to a story that ran in February in the San Antonio Express-News, the UT System stands to lose $78 million in federal research money with the sequestration. Patricia Hurn, vice chancellor for research and innovation, pointed out that, although the federal government provides less of the University’s funds than in the past, the University would be harmed by the cuts because it is still “strongly dependent on federal funding.” For this reason, according to The Washington Post, representatives of universities across the nation were in Washington to lobby against the cuts in March. One UT System official searched for a silver lining. Regent Alex Cranberg speculated that perhaps a cut in federal funding would be advantageous for professors because, when they get such money, they spend most of their time “in administrative and compliance activities.” He asked, “Might this shift be good news for us for our children not having to fund this exorbitant federal deficit and for our researchers to be able to spend more time actually doing research?” Hurn disagrees. She says that researchers go through the same hoops for state and privately-funded research compliance. What’s wrong with this picture? Let’s assume that Cranberg is right and that without federal funding researchers could work without the onerous oversight by the federal government. If researchers have significant reductions in funding, what money will pay for their research? Cranberg’s argument is akin to saying, “If you’re fired from your job, you won’t have to clock in, fill out W-2 forms, or pay Social Security taxes!” I agree with Cranberg that room exists to streamline researchers’ federal compliance obligations. Anyone who has filled out a lengthy Institutional Review Board application to do a simple class survey can attest to the weightiness of regulations. However, once again, Cranberg seems to have signed onto the notion that government is not an entity to be reformed, but a nuisance to be eliminated. Cranberg, following the philosophical line of Gov. Perry’s inner circle, denigrates the contributions of the federal government and believes that business would do better without government oversight. 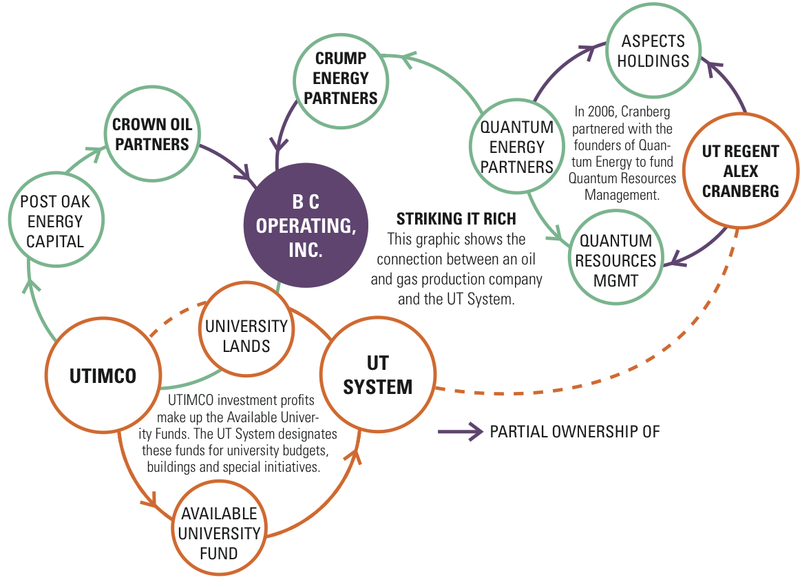 He, along with the now-departed Rick O’Donnell, former adviser to the UT System, has brought UT into that ideological debate by pushing the “university as business” model. But don’t fall for it. We are not independent. Half of our money comes from federal funds, and, as Hurn rightly points out, cheering the suicidal actions of our federal government is not good for the University. Cranberg has every right to be politically conservative. But as a regent, he should not let his disdain for the federal government blur his vision about the stark realities facing this University. His comments should give Texans pause as to whether Cranberg and Perry are really serving in the best interests of the University. Knoll is a Latin American Studies senior from Dallas. According to the Federal Election Commission and opensecrets.org, five out of eight non-student UT System regents have made contributions of $2,500 — the maximum allowed under Federal Election Commission rules — to Texas Governor Rick Perry’s campaigns for the governorship or presidency. Though these relatively modest sums aren’t enough to warrant cries of cronyism, other much larger contributions to state and national conservative political groups make it clear that raising money for the Republican Party isn’t a bad idea if one aspires to be a regent. While political donations of all sizes surprise few after the decision reached in Citizens United v. FEC, the extent to which many regents associate with and support like-minded political organizations underscores how the board, which exists to provide leadership for the system’s 15 universities, deliberates and makes decisions that will affect the quality of higher education in the state of Texas. Few, if any, dissenting voices exist to counter the political ambitions of the majority of board members. One example of board members’ commitment to conservative causes is chairman Gene Powell, Jr.’s assistance in raising $102,475 for Republican Sen. John McCain’s presidential run in 2008. The $2,500 campaign contribution limit applies to national political figures as well, so after meeting that limit, Powell worked as a “bundler,” encouraging friends and associates in high places to make contributions to McCain that Powell could bundle and deliver to the campaign in one mega-check. Board Vice Chairman Paul Foster has made consistent donations in the low thousands to former Republican Sen. John Cornyn and the American Fuels and Petrochemicals Manufacturers Political Action Committee. Additionally, Foster has given $200,000 in the past two years to conservative super-PACs Make Us Great Again, a political action committee supporting Perry, and American Crossroads, the super-PAC formed by Republican strategist Karl Rove that was partly responsible for Republican victories across the Midwest during the 2010 senatorial elections. Most salient of all, records show that Regent Alex Cranberg gave $2,100 to the group Coloradoans for Rick O’Donnell in 2005. While serving as director of Colorado’s Department of Higher Education, O’Donnell, a Republican, made his second unsuccessful run for the Colorado State Legislature. As evidenced by his campaign contribution, Cranberg, a fellow Coloradoan, knew about O’Donnell and approved of his politics. In the same month that Gov. Perry appointed Cranberg to the Board of Regents, O’Donnell was hired to serve as a special adviser to the UT System. His employment ended after only a month and a half on the job, likely because of the public outcry against the controversial policies he pushed. He made an impression quickly with his antagonistic attitude toward university research, outspoken advocacy for “efficiency” and questionable connection with the Texas Public Policy Foundation, a conservative nonprofit think tank based in Austin. Regents’ campaign contributions show that O’Donnell’s voice wasn’t the only one championing a right-wing agenda. Though O’Donnell left the Board of Regents before he was able to enact any of the reforms he suggested, his ideas about evaluating UT’s effectiveness solely by quantitative measures such as graduation times continue to dominate the debate about UT’s future. Matt Angle, founder of the Lone Star Project, a federal political action committee that fact checks Texas Republicans, cites such questionable political connections as the consequences of one-party rule. In an overwhelmingly conservative state, it isn’t shocking that the regents’ political affiliations are also conservative — especially since they are appointed by one of the most conservative governors in the country. We shouldn’t be surprised when the Board of Regents pushes conservative reforms to higher education when its history of political activity makes the writing on the wall so clear.